For a workout that primes your muscles for daily activities (like lugging boxes, loading palettes, lifting toddlers or stacking tall shelves), try functional training at our Newtown Square health club. At Ellis Athletic Center, we’ll help you improve balance, stability and flexibility with TRX (total body resistance exercise) — a suspension system that uses straps attached to a stationary point — and your own body weight controls the workout. Our certified trainers will guide you through endurance-building movements to ensure proper technique and duration. Fortify your core and train your muscles to work together. 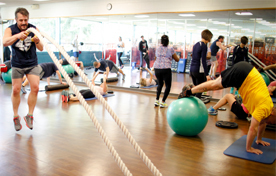 Try functional training at our gym in Newtown Square with a free, 3-day trial membership.